It pains me to say it, but I did not like this book. At all. I knew going in that it might not work for me. I've read one of Aickman's collections so far, and many of the stories left me unsatisfied. But, it was just one collection; maybe I read it wrong? It happens. 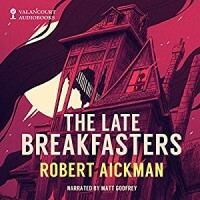 But after listening to this wonderfully narrated story, I think it will be a long time before I attempt to read the other Aickman collection that I own. The man writes beautifully, there's no doubt about it. He is also capable of sly social commentary and has a keen eye for the reasons behind certain behaviors; I appreciate that. But, and forgive me for asking, where is the damn story? This seemed more like a rambling tale about repressed sexual feelings, that sometimes features a nice enough lady named Grizelda. There are a few, I stress FEW, weird moments...and that's about it. The narration here is fantastic and to be honest, if it weren't for Matt Godfrey's soothing voice, I would have ditched this book without finishing. It seems like with such promise in the voices, the story just HAD to get better, or at least show up. But sadly, it never did. As I mentioned, the prose itself was excellent as was the narration, hence my 3 star rating. If I were rating on narration and quality of prose ONLY, it would be 5 stars. But for me, there has to be a story, and here I could not find one. This is obviously how I and I alone feel about The Late Breakfasters. Your mileage may vary.